Play At Home Mom LLC: Light Panel - Who? What? When? Where? Why? How? Light Panel - Who? What? When? Where? Why? How? 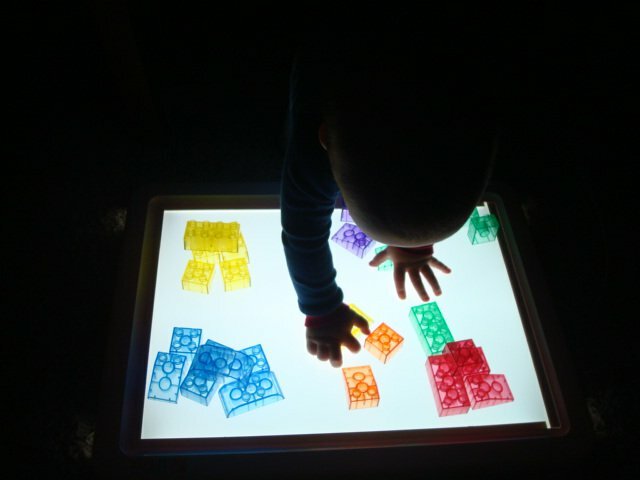 Light table in our playroom. Light table accessories hanging on pegboard. 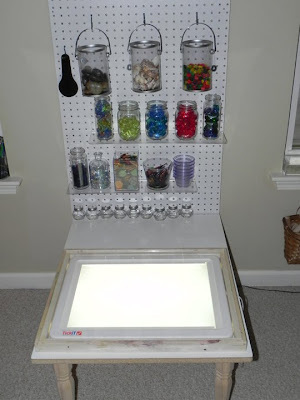 Click HERE for great light panel activities! A light panel is fun for all ages! We have had our light panel since my son was born (for 3 years). Here he is exploring on it as an infant. 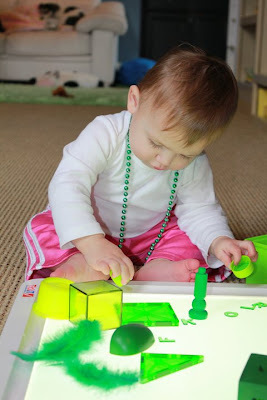 This is RLs youngest daughter as an infant exploring and learning the color green on their light panel. 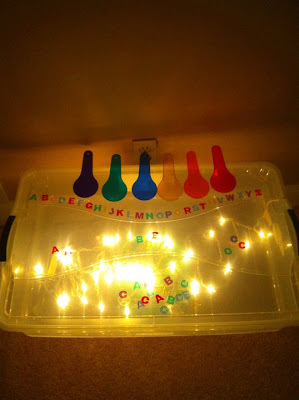 This is the homemade light box AB made for her daughter. Clear bin and Christmas lights - simple. You can add some parchment paper to the inside of the lid to distribute the light more evenly. Everyone can enjoy a light panel/box/table. Click HERE to see some you can purchase. Click HERE to see a do it yourself version. Also check out our pinterest page for more inspiration. I love that even a little person can learn and explore! What are the dimensions of your light table? My FIL is going to build one for us. Also, do you have any building insights for us? Anything that is super important to making the table the best it can be for the kids? I think we are going to invest in a light panel/table for our big holiday gift. 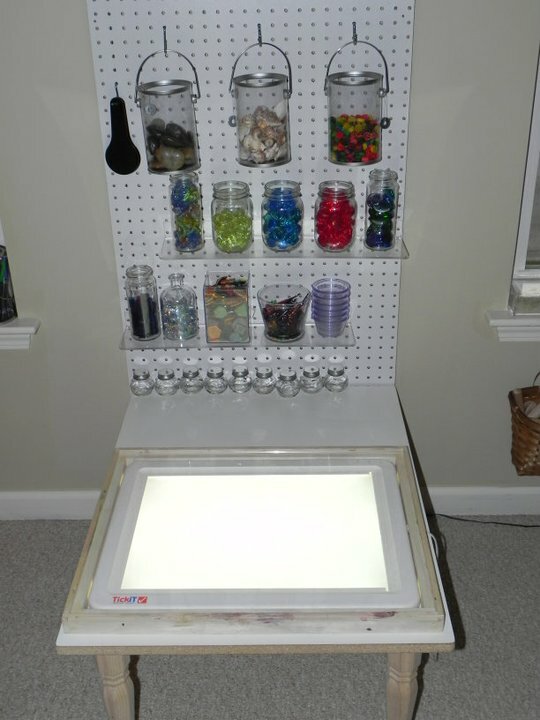 Which light table accessories do you think are a must have? There seem to be so many options! I have a 3 year old daughter and 18 month old son. I am new to your blog and FB page and it is amazing! What great ideas for truly creative and fun play. Where did you buy your lighttable? Yours looks much thinner than most of the models I'm finding (including on discount school supply). I just found your site! Wow.. Thanks you for all that you do for all of use and our little ones. I am getting more and more creative thanks to you!I can't wait to make a Light panel among other things! !